This is my first blog post in 2016. My previous post was published in September last year. It has been a while, hasn't it? A few people have contacted me requesting that I write posts or share modules about the new UPSR format. Some friends are expecting blog posts about my recent trip to Birmingham. I'm supposed to be spending this Labour Day break to prepare materials for a workshop that I have to conduct on the 5th, or complete my Literature Review for my masters proposal. I'd like to sit down and get all those things done, but the urge to write this post is very persistent and I don't think I can ignore it any longer. You're the perfect person for this job! KK teachers are so lucky to have you! You've gotta CHANGE the system! The best teachers should stay in the classroom. Anybody can do office works, but not everybody can teach! Why would you want to waste your talent? People who know me know how much I love teaching and how much I love my students. They can't imagine how I can NOT find it heartbreaking to leave the classroom that I love so much for a job that mostly requires me to do clerical stuffs and attend endless meetings. Do I miss teaching? Of course I do. There was one time in my first week at the new office when I locked myself in the wash room so I could cry a bit without anyone seeing. It was during this time when a few close friends received text messages from me, telling them that I had probably made a mistake. I felt like I had made the wrong choice. I've been thinking about it, and decided to embrace this new role any way. And although I still find myself struggling to find fulfillment (confession: it's my fifth month, but I'm still adjusting) I've made up my mind to stay on for at least a couple of years. Why? I'll tell you why - but first please read on. In my previous post, I wrote about why I like attending conferences, and how I wish that Malaysian teachers are provided more support to attend conferences. 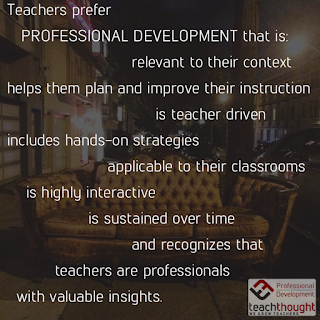 I wrote about the need for teachers professional development to be given more importance. I shared how teachers can do it for themselves. And I also wrote a little bit about what kind of professional development that inspires me and what kind that turns me off. I've chosen to make this post a continuation of that previous post. In addition to teaching, I'm also deeply passionate about teachers professional development. One of the reasons why I decided to accept this role as the district English language officer is because it gives me the chance to play a more direct role on teachers professional development in my area. I'm curious about what I can do about it. "The quality of a school system cannot exceed the quality of its teachers." I read through the Blueprint and learned about how the Ministry is making a commitment towards improving the quality of Malaysian teachers. I read about how the Ministry aims to do this - how a large sum of money will be spent on teachers upskilling programmes, how in-service trainings will be more school-based, how the pre-service training will be revamped. And apparently the Ministry also believes that by transforming teaching into a 'profession of choice', i.e. by raising the minimum academic requirements for entry into teachers training institutes, the profession will attract applicants among the best performing students and hence, the system will have more 'good quality' teachers as a result. The lists above are certainly not exhaustive. Try googling 'good quality teaching' and you'll surely find uncountable sources offering definitions, criteria and explanations on the topic. Some definitions or criteria will pop up more than once and in more than one sources. And although different people have different ways of explaining what constitutes great teaching, I believe most of us have more or less the same idea. 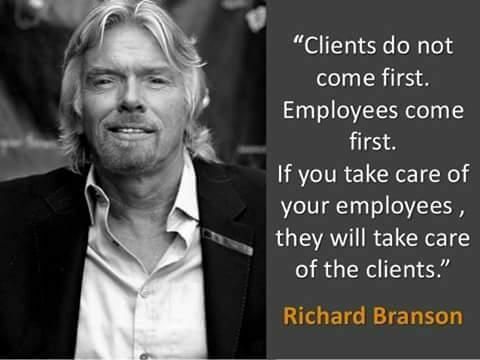 What makes it different is each person's focus and what he or she chooses to prioritise. At the end of the day, I believe that the ultimate goal is to optimise learning and maximise the students outcomes. Throughout my years of teaching, I've had the privilege to meet and know a lot of great teachers whom I think display teaching quality of the highest degree. These teachers are creative, innovative and inspiring, and they blow my mind. Allow me to list down just a few examples. I'm lucky and blessed to have Jen Renita Mappah, an Excellent Teacher in Tawau, as one of my closest friends. Like me, she is crazy about conferences. She attends every conference she can afford, and she has won a lot of awards for innovative teaching. She has unique approaches to teaching and has produced a lot of classroom innovations. She is also a teacher-researcher - she strongly believes in action research and its positive impact on her pedagogical practices and her students' learning. You can see examples of her work by following her Facebook page, Teaching English: Creative and Innovative. Jainah Sulaiman is another example of a great teacher. Have a look at her Facebook page, Teaching English: Fun Learning and you'll know what I mean. Her passion is in teaching very young learners, and she produces some of the most beautiful teaching aids. Her classroom is like heaven for children. She also believes in sharing - she has presented her work in a few conferences and has conducted seminars and workshops in her district to inspire teachers. And yes, she is also an Excellent Teacher. Another example is Dilla Kamal. I bumped into her at ICELT in Malacca last year. Like my friends Jen and Jainah, Dilla is also an avid social media user and she does a lot of lessons and materials sharing on her Facebook page, Teacher Dilla's English Lessons. She has also presented in a lot of conferences and has won awards. Nazira Roslee is one of a kind. I met her for the first time at the MELTA conference in Kuala Lumpur last year, where she won the Malachi Edwin Gold Award for Creative Teacher Showcase. Nazira loves technology and she loves experimenting with technology to enhance collaboration in her classroom. You can watch a recording of her session on Collaboration in the ESL Class at the Education on Air conference here. She loves doing projects, and some of her lesson ideas are really mind-blowing. She doesn't confine her teaching to whatever that is on the textbook. For example, to teach one of the topics in the Year 3 textbook (A Walk in the Safari Park), she started a crowd-funding effort so she can bring her kids to the zoo. You can read all about it here. She has a lot of other achievements - if I were to list them down it would surely take up the whole page! Rahmah Sayuti is my idol. She has done it all - present in conferences, win awards, publish books, publish journal articles, write as a columnist for newspapers, manage a blog, conduct workshops and seminars. She is an Excellent Teacher, an Innovative Teacher, a Researcher, an inspiration. You can find out more about her by visiting her blog, English Oasis. There are a lot others - Adibah Khalid (fondly known as Mommy Deeba) a teacher and headmaster in Johor with her innovative approaches to teaching writing; the award-winning teacher who also happens to be my good friend Audrey Koh-Wiles - MUET specialist (her blog MUET My Way has over 3 million visitors), motivator, philanthropist, entrepreneur (and a lot of other wonderful things) - and many, many more. There are lots of great teachers out there it's just impossible to list them all down. Now, what do these teachers have in common? Apart from being creative, innovative, mind-blowing, and winning a lot of awards - what else do they have that makes them great teachers in my eyes (and the eyes of many others)? The Blueprint talks a lot about students outcomes and how to maximise them. It discusses programmes and plans that the Ministry decides to undertake in order to achieve this. I believe those programmes and plans are beneficial and will impact students outcomes positively. But let's imagine an education system filled with teachers like Jen Renita Mappah, Jainah Sulaiman, Dilla Kamal, Nazira Roslee, Rahmah Sayuti, Adibah Khalid, Audrey Koh-Wiles and others who are like them (let's call them Super Teachers). Let's imagine what would happen if every teacher in every school in Malaysia is just like these Super Teachers. Do we still have to worry about students outcomes? Despite the constant transformation in curriculum, the pressures of workloads, the ever-changing demands from stakeholders - these Super Teachers bloom and thrive. They stand out. The beat the odds and they inspire. Don't we want more teachers like them? A lot of teachers can be creative and innovative and deliver mind-blowing lessons, but what sets these teachers apart is their autonomy as teachers. These Super Teachers are all autonomous teachers. They don't let the curriculum define their teaching, they define the curriculum with their teaching. Honestly, I don't know whether all these Super Teachers will get the full score 6 when evaluated against the 12 aspects in SKPM Standard 4, or if my admiration towards them match the inspectorates perception of what constitutes good quality teaching. But I know this one thing: Great teachers inspire. So okay. We have recruited the best of the best trainees (read: high achievers in national exams) for our teacher training institutes. We have also revamped the pre-service training programmes. We have provided more opportunities for in-service teachers to receive personalised trainings through school-based coachings. What kind of teachers do we aspire to produce through all these initiatives? Teachers who get the full score 6 in all the 12 aspects in SKPM Standard 4? 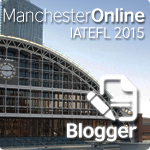 Teachers who fulfill the criteria of 'good quality teaching' as perceived by the inspectorates? Maybe. We can set those as our aims, of course. And there's nothing wrong with that. But I also believe that it is important for us to produce great teachers who inspire. Now let's go back to what the Super Teachers have in common. I've mentioned that they're all autonomous, and they define the curriculum through their teaching. Another thing that these Super Teachers have in common is their passion for continuous professional development. I believe in this with all my heart: you can't inspire others if you yourself are not inspired. These Super Teachers are able to inspire others because they are constantly inspired through professional development programmes that they participate in. And these professional development programmes are not limited to courses and workshops organised by the district education office or the state education department or the Ministry of Education. 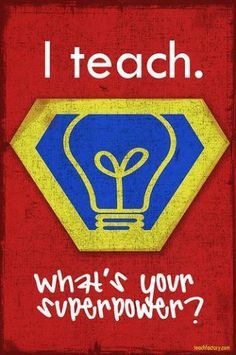 These Super Teachers read books and articles, participate in webinars, subscribe to newsletters, share lesson ideas through social media, write articles and blogs, do projects, conduct research and present in conferences. In other words: they take charge of their own continuous professional development. As a teacher, I aspire to help my students become autonomous, independent learners who have deep love for life-long learning. As a district English language officer, I aspire to help teachers become autonomous, independent professionals who have deep love for continuous professional development. "She does EVERYTHING I ask her to do"
Last year, I had the privilege to be the mentor for a teacher trainee who was doing internship in my school. One day, when we were discussing her lesson preparation, the trainee described the challenge that she was facing. She had difficulty incorporating a particular teaching methodology into her classroom activities. "I'm not able to make it fit," she sighed. "Because it doesn't fit," I responded. "It doesn't make sense. It's not suitable." "Why don't you try to do other things? There are a lot of other..."
"But Miss Cindy," she interjected, exasperatedly. "My supervisor likes it." "Yeah. In order to get good marks, I need to use the methodology in ALL my lessons." "Well, maybe not all." She winked at me. "Only when he's observing." Earlier this year, I had a drink with a group of educators. One of them, a teacher trainer, happily announced, "I'm so proud of my coachee today." "Did you observe her lesson today?" I asked. "Yes, and she did extremely well." He grinned proudly. "She did everything that I told her to do. EVERYTHING." "Was she happy about the lesson?" "Happy? He looked at me in disbelief. "Of course she's happy! I gave her an A+!" I don't want to claim that all teacher professional development and training programmes in Malaysia are like these. But I've seen these happen a lot. A LOT. Trainers telling trainees what to do. Coaches telling coachees what to do. 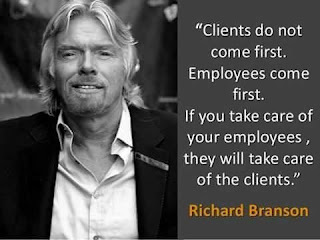 And the trainees and coachees would have to do it exactly in the way that the trainers and coaches would want them to do it. It's like this. If I'm a trainer and I like group work, I'll expect that my trainee would do group work in her lessons too. If I love to use technology in my classroom, I'll force my trainee to use technology in the classroom even if she has insisted that technology is just not her cup of tea. We can't produce great teachers who inspire by training them to please their trainers. Great teachers who inspire are produced through training programmes that give them empowerment to choose the kind of teachers that they want to be. Training and professional development programmes should be designed to help teachers and teachers-to-be find their own strengths, and to use those strengths to deliver effective lessons. It is not about fulfilling a prescribed criteria, or applying a prescribed methodology. 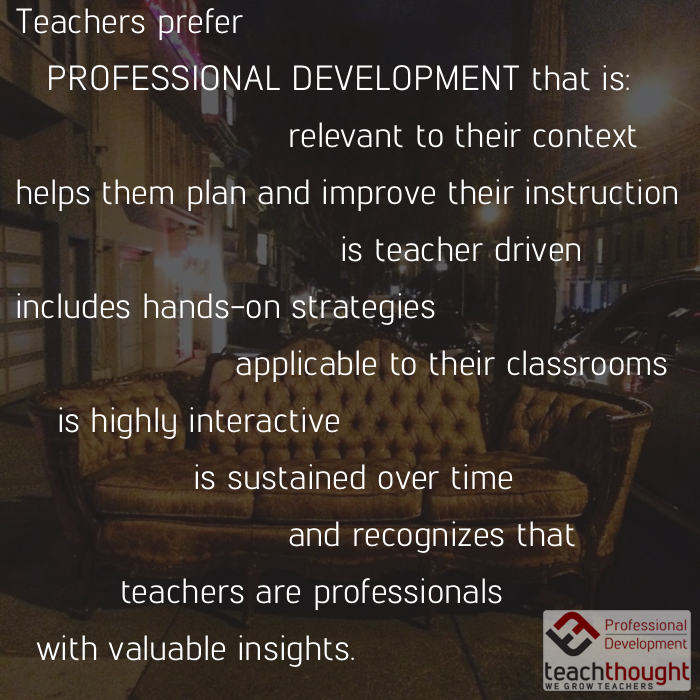 Professional development should never be prescriptive. It should be inspiring. And empowering. Haha. I don't know what gives people this idea, but I have never left teaching. I'm a teacher and I always will be, no matter where you put me. I decided to learn how to embrace this new role given to me because I'm curious about what I can do for teacher professional development in my area. I have a few ideas that I want to experiment with. I don't know if they'll work, but I still want to give them a try. I'll write about those new ideas when I have the chance. Or as soon as I have executed them. thanks for an enlightening post and i don't mind you mentioning me at all :)i understand why you are taking on this new role. you can impact more teachers in your new role and help them in their professional development. Don't regret your new role. 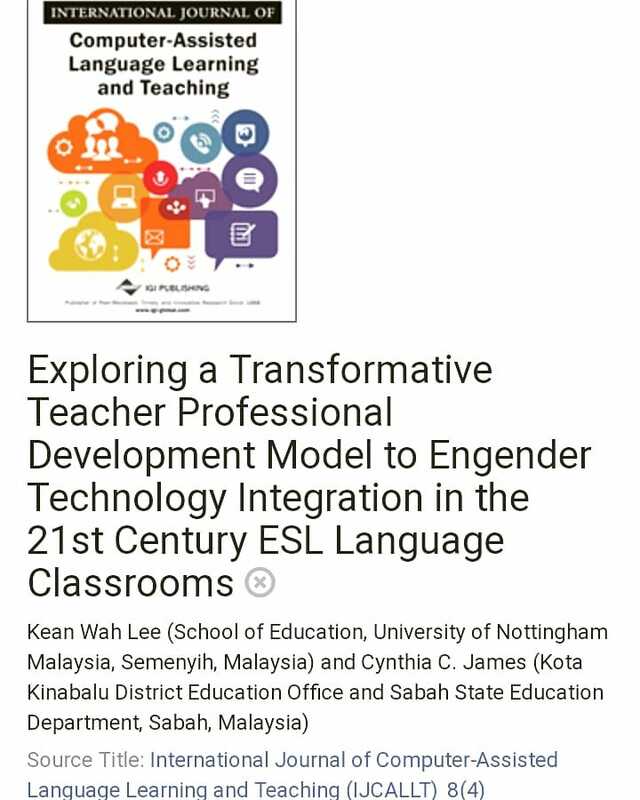 Wherever we are and in any capacity, we can give our best :) i am coming to the end of my career but still hope to contributed to ELT as much as i can. it's not easy if you don't have people of the same wavelength. i feel so blessed having reached the max of my career and it is so heart warming to see many young ones such as yourself who make ELT an interesting vocation. before i turn this into a boring thesis, i better stop! no regrets cynthia, full speed ahead captain! Great post Cynthia! I'm really happy that you become the DELO for Kota Kinabalu. In fact, you can help many teachers. You have shared a lot through on line published materials before but with your new role teachers will be able to get direct contact with you. You have contributed a lot and this time you have also the power to help and to strengthen the teachers skills through more strategic plans. By the way, I'm so grateful getting direct consultation from a superteacher like you. At the early stage of my teaching career (since 2009), I was impressed with your on line shared materials and had always use it to help my students. Thanks a lot Cynthia! Just keep on moving!!! I'm an undergraduate and I have an assignment which requires me to interview or having a chat with Malaysian teacher. So, I would like to ask you a question: "What are writing problems faced by Malaysian writing teachers?" I would like to thanks you in advanced for your time. I really hope that you can help me answering the question above. A culture of compliance that emphasises narrow grade-based rewards/incentives is not compatible with a focus on learning. Some teachers are unfortunately put in situations where they have to suppress their professional judgment in favour of complying with the demands of their superiors, whose assessments have a heavy bearing on those junior teachers' professional trajectories.